Digi-Schlock: THOU SHALT NOT KILL… EXCEPT (Synapse Blu-Ray/DVD Combo Pack) – Schlockmania! Despite being aimed at technophiles, the blu-ray format is also producing a lot of impressive material for fans of exploitation filmmaking. Indeed, high-definition video has made it possible for b-movie buffs to see films known for a battered and bruised visual style in a whole new light. Synapse Films is one of the best companies when it comes to pulling off this sort of video magic, as they have proven in the last few years with great-looking transfers of films like The Exterminator and Frankenhooker. 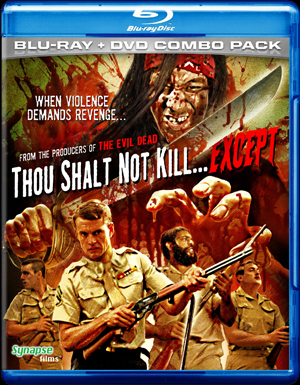 Their new blu-ray/DVD combo edition of Thou Shalt Not Kill… Except is perhaps their best achievement yet in this area. The blu-ray is the disc that was watched for this review and simply put, it’s a revelation. Like many a low-budget indie genre film, Thou Shalt Not Kill… Except was shot on 16mm film and later blown up to 35mm for theatrical release. 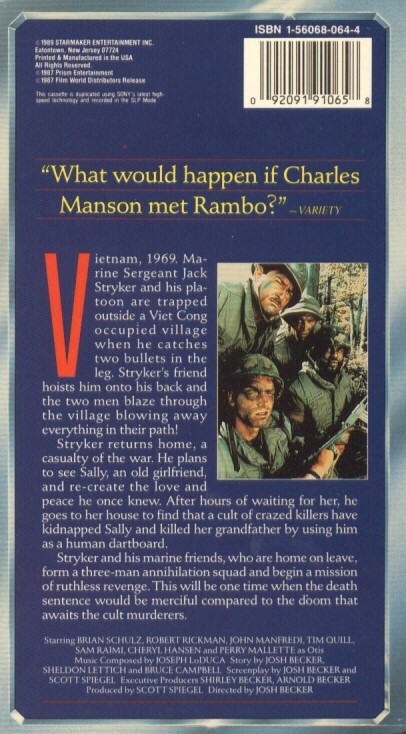 Thus, the VHS versions of this title always had a grainy look and even the improved Anchor Bay DVD suffered visually due to a non-anamorphic transfer. Synapse went back to the original negative to create a new high-definition transfer and the results are stunning. Image quality is sharp as a tack, with bold colors and a level of detail that jumps off the screen. The results retain the film’s low-budget charm but allow the viewer to appreciate how skillfully shot this film is. The audio portion of this transfer sticks to the original mono soundtrack but the results have gotten a lossless upgrade that is pretty impressive. It delivers an up-front, aggressive mix: no stereo separations here but the effects and Joseph LoDuca’s impressive musical score come through nice and clear. This set also includes an impressive amount of bonus features, the majority of them produced especially for this set. The package begins with two commentary tracks. The first pairs director/co-writer/etc. Josh Becker with Bruce Campbell, who served as sound editor here but was the star of the original Super-8 version. The two have the camaraderie you’d expect from two people who have survived the low-budget trenches together and they create a witty, action-packed track that gives you a detailed history of the film. It’s tough to narrow down the highlights on this track: you’ll learn why Campbell was in the 8mm version but couldn’t be in the feature version, the complicated genesis of the film, how Becker coped with running out of money early in the shoot, Scott Spiegel’s fetishistic mania for vintage prop placement and why one soldier wore a wig during the shoot. Since Campbell did the sound effects, this allows him to point out where particularly sounds were borrowed from The Evil Dead and some Three Stooges shorts. In short, this track is endlessly informative and sometimes fall-down funny. Any student of low-budget genre filmmaking should give it a listen. Synapse also produced a new commentary track for this set that pairs actor Brian Schulz with extras producer Michael Felsher. This is a real coup for fans as Schulz doesn’t appear anywhere else in the extras and is rarely heard from. Schulz discusses how he ended up in the film, how it was radically different from any of his prior acting work (up to this point, he was a stage actor who did a lot of musicals) and the unique challenges of playing such a macho, larger-than-life role. Felsher engages the actor with questions that ensure a steady stream of chatter, including a lot of discussion about Schulz’s thoughts on the other actors and how he related to them. The end result is a pleasant listen that will fill in some knowledge gaps for the film’s fans. This set also features an excellent new making-of featurette from Felsher: “Made In Michigan” covers the film from its genesis through its release and incorporates interview with Becker and a few crew members as well as substantial input from actors Tim Quill, Robert Rickman and John Manfredi. Becker is typically frank and self-deprecating about his work in ways that generate laughs while the actors and crew discuss their work with great fondness, reflecting on how this little low-budget quickie became one of the best experiences of their varied careers. Felsher paces the set with a judicious use of clips from both versions of the film as well as clips from a student short by Becker. It all adds up to a fun, informative addition to Michigan exploitation flick lore that will be appreciated by anyone in the Raimi/Spiegel/Campbell/Becker fanbase. 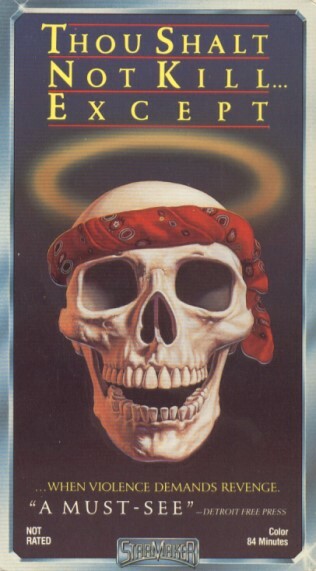 Elsewhere, the disc features a short interview with Bruce Campbell in which he reflects on Thou Shalt Not Kill… Except‘s development from an idea discussed after the shoot of The Evil Dead to a full-fledged movie. Other, shorter extras include a deleted scene with optional commentary from Becker on why it was cut, an alternate titles scene and an amusing trailer with hard-boiled narration that really plays on the biblical connotations of the film’s release title. 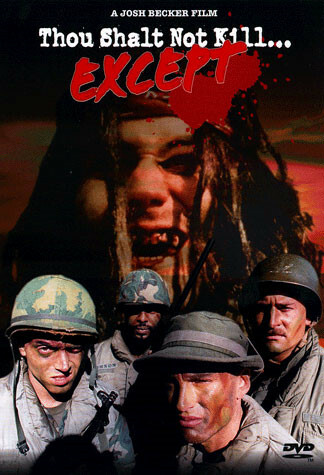 All of these extras are impressive but the biggest draw here is Stryker’s War, the original 8mm version of Thou Shalt Not Kill… Except with Bruce Campbell in the lead role. It looks surprisingly good despite its age and offers a lot of insight into how the film developed from its humble origins: several fight sequences and shots are carried over verbatim to the feature version but key plot elements and scenes would be reworked to stronger effect in the later version. It’s as exciting and bloody as its big-screen counterpart and its presence here is another big treat for longtime fans of Bruce Campbell. Simply put, the quality of transfer and the bountiful extras make this set another high-def winner from Synapse. It’s unlikely that anyone will ever produce a better or more informative edition of this title so fans should pick it up without hesitation. To read Schlockmania’s film review of Thou Shalt Not Kill… Except, click here.